Koh Samui Airport is a small airport yet many arriving here for the first time are left confused. Unlike most airports around the world, Koh Samui Taxis are not permitted to queue inside the airport grounds. Therefore new arrivals must pre-book via the Internet, or go to the Taxi Desk, and a Taxi driver will be booked. 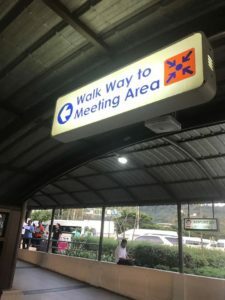 As you exit Baggage Reclaim you will come to the first Meeting Area from here you can take a shared minivan which is arranged by Samui Accom. Prices start from 120 baht per person depending on your hotel/resort location. A price list is clearly highlighted. The negative side to a shared transfer is that you must wait until the van is full before it leaves. Dropping off at each hotel/resort. This area is also where VIP customers will meet their Airport Taxi Transfer. Four Seasons, Conrad and the Intercontinental. All other passengers arriving and booked an Airport Taxi Transfer must follow the Meeting Point Sign. Follow the pathway under a tunnel and to a travelator. This is the Meeting Area for all other passengers arriving at Koh Samui Airport, requiring and Airport Taxi Transfer. This is the Meeting area for transfers booked via the resorts/hotels and Private Airport Taxi Transfers, and bookings made via Tour Agencies. At Koh Samui Airport after 15 minutes of waiting, drivers must pay a 20 b fee for every 15 minutes they are waiting. Therefore the drivers will wait at a convenient parking area outside of the Airport grounds until after the flight has landed. Therefore before leaving home take note of the contact number to call the company. If you can not locate your driver upon arriving at the Meeting Point simply ask at the Taxi Desk to call the number for you. Also bearing in mind that the drivers do have this fee to pay extra, show some respect and hurry yourself along to the Meeting Area.